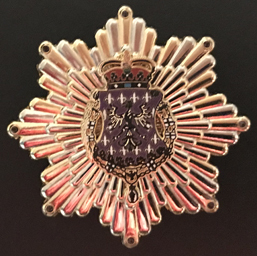 The Star of Coberly v. Reichenberg is the principal decoration of the Ecclesiastical Principality of Reichenberg and the Regency of Würzburg. Rarely awarded, it is the personal gift of the Prince of Reichenberg. Candidates are chosen in recognition of their longterm record of service and accomplishment, their personal conduct and merit, and their sense of loyalty and duty. Members are styled Companions, and the honour is given in three grades: Companion with Amethysts, Companion with Sapphires, and Companion with Emeralds. Additionally, Companions receive further designation as a patrician or noble of Würzburg. Membership is hereditary. The insignia consists of a star in two-tone metal with the household shield of Coberly v. Reichenberg in the centre surrounded by the collar of the Noble Company of St. Mary of Walsingham. At the main points of the star are small jewels corresponding to the grade of the recipient. Companions with Amethysts additionally may wear a cordon in purple with two white stripes.